Shiretoko has the highest population density of brown bears in the world. Its bear watching cruises have become hugely popular because of the high likelihood of seeing bears from the boat. The Shiretoko peninsula is densely populated with brown bears. The population in Shiretoko National Park in particular is one of the highest in the world – you might see over 10 within a 400m radius when the conditions are right. The home range size of female bears is just 1/10 to 1/20 of that in Alaska, showing just how good the feeding conditions for bears are in Shiretoko’s natural environment. The area’s topography can be thanked for much of this. The Shiretoko peninsula is long and narrow, measuring around 70km long and just 15km wide in the center, with 1400-1600m-high mountains extending along the center like a spine. The mountains are close to the sea, with only a small amount of flat land by the sea and steep terrain covering the majority of the peninsula. This topography makes for a diverse ecosystem, due to the wide range of feeding grounds and climates in a small area. It also means that bears don’t have to roam far, resulting in the dense population we see. 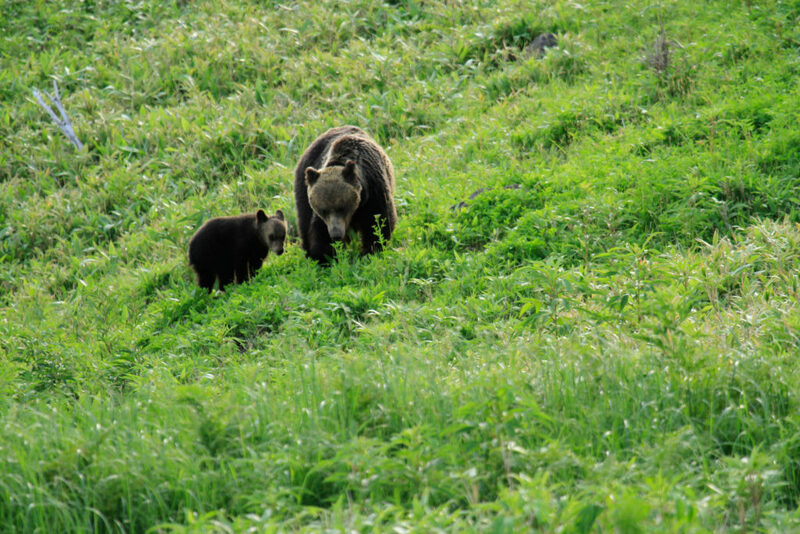 You are highly likely to see bears with their cubs in Shiretoko. 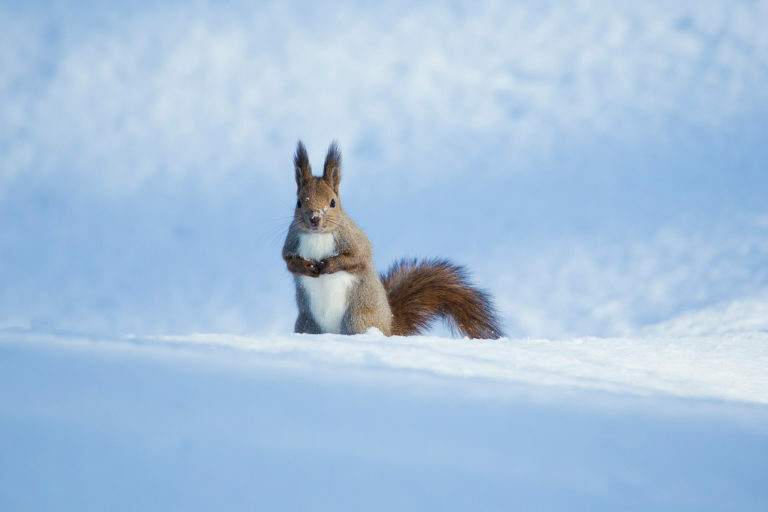 Shiretoko’s comparatively mild, humid summers provide the right conditions for a thriving forest ecosystem, with an abundance of food sources such as nuts. Salmon also swim back up the rivers from late summer through autumn, offsetting the scarcity of food caused by fluctuations in nut growth that occurs in other regions. Because bears give birth during their winter hibernation, birth rates depend on the food conditions before hibernation. 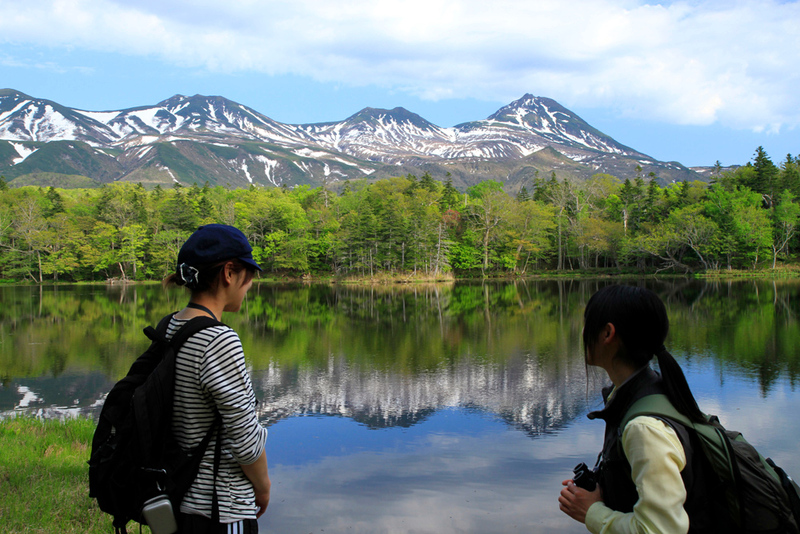 Shiretoko Goko Lake © Shiretoko Nature Office Co., Ltd. So Shiretoko has a dense brown bear population… but is it easy to see them? 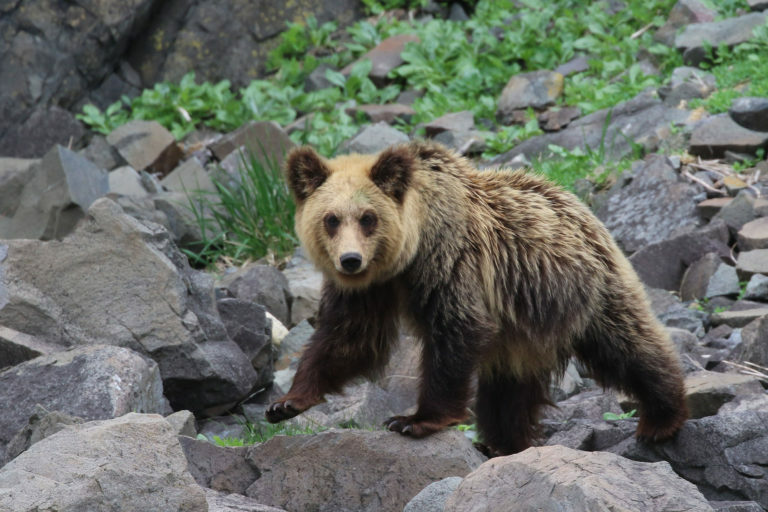 While Shiretoko has a dense population of brown bears, that doesn’t mean you’ll see them everywhere you go. That’s because there are none of Alaska’s vast expanses of flat land with shrubs and grasslands where you can see far off into the distance. With its mountainous terrain and forests, you can’t see bears in the distance. You can see a few bears by the road almost every day between spring and autumn, and depending on the year, you can also see them on a daily basis from the walking tracks. But with that said, there’s no way of determining when or where you’ll find them. Yezo brown bears © Shiretoko Nature Office Co., Ltd. If you really want to see the bears, I recommend seeing them from the sea. There is a cruise from the Utoro area of the Shiretoko peninsula that takes you along the coast, giving you a view of the beautiful scenery from the sea. There are a variety of boat sizes and cruise lengths. I recommend taking a cruise in a small boat for 2 hours or longer. The big boats go far from land and don’t stop when bears are sights, so many passengers miss them. A small boat increases your chances of seeing bears, and they stop if possible so you can get a good look at the bears. How close you can get still depends on the depth, though, so I recommend bringing binoculars. 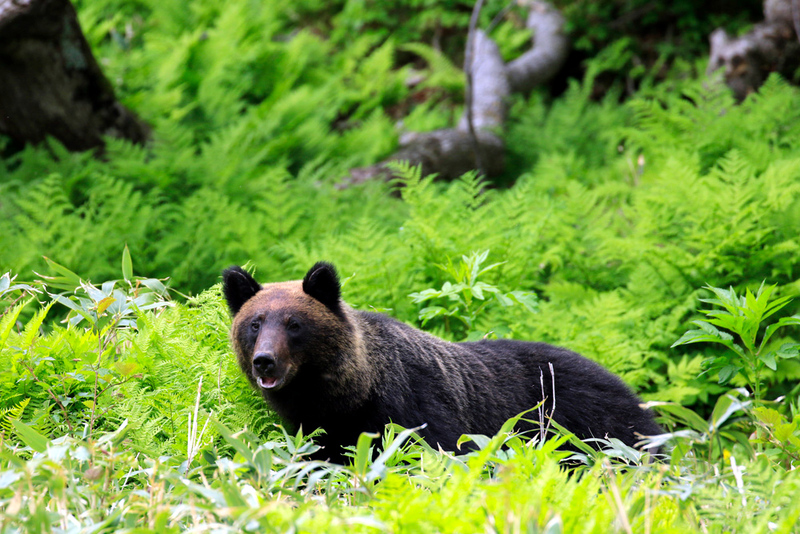 The best time for bear watching is spring and from late summer through autumn. 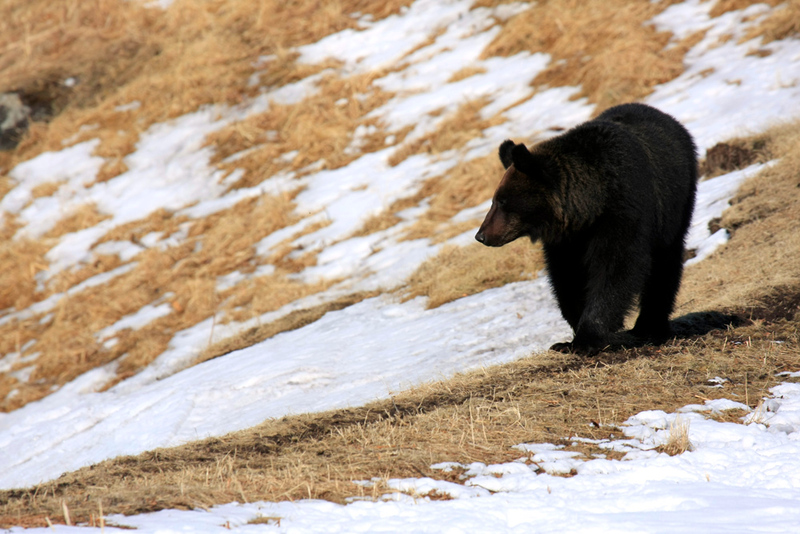 Bears often search for food near the coast in spring because the inland areas and mountains are still covered with snow, increasing your chances of seeing them. Meanwhile, you’re likely to see them near river mouths from the end of summer through autumn, as this is where the salmon swim back from the sea. In some years, your chances of seeing the bears are over 90%. I think cruises are the best way to see them because you can relax and watch them from the safety of the boat. While the one-hour cruises offer an amazing view of Shiretoko’s nature, I recommend taking as long a cruise as possible if you want to see the bears. The long cruises not only cover a wider area, they also pass the Rusha area, the spot where bears are most often sighted. You can only reach that area on a cruise that is two hours or longer. 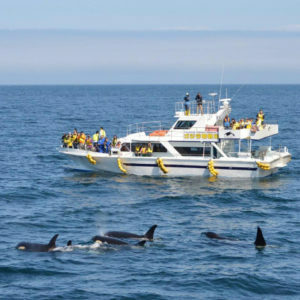 You can also see dolphins on the long cruises, and sometimes even whales. You’re also more likely to see birds of prey like white-tailed eagles and peregrine falcons, as well as rare seabirds like the spectacled guillemot, which can only be found in a few places in the whole world. I recommend sea tours not only for the bear sightings but because you can see a wide variety of the wildlife that lives in Shiretoko. To avoid being attacked, never approach a bear when you see one. It’s also dangerous to run away fast, because bears are used to chasing prey that runs. They can run at speeds of over 50km/h, so they’ll catch you right away. 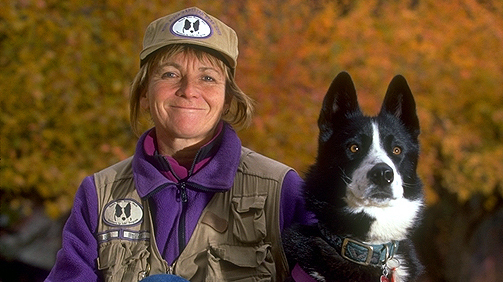 If you find yourself near a bear, stay calm and leave the area slowly. You also need to be careful if you come near a bear while driving. Some tourists stop and take photos because they think they’ll be safe in their car, but a large bear can push a car over. Some tourists have even had their car shaken by bears. Don’t assume that your car will protect you – you still need to keep a safe distance. You must also never feed the bears. When people have fed bears in the past, this caused the bears to deliberately approach humans, and the bears needed to be killed. Feeding bears doesn’t just make them a danger to humans; it gets them killed. You can find out more about bears at the Shiretoko World Heritage Center at the entrance to the national park in the Utoro area, or at the Shiretoko Nature Center in the park. I recommend arming yourself with information to avoid dangerous situations with bears. 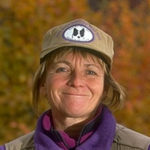 The Shiretoko Nature Center has dedicated bear rangers who can tell you everything you need to know about how to stay safe around bears. You can also borrow food containers and rent bear spray if you’re going camping in the mountains. In order to coexist with bears, it’s important that we all learn how to act around them. No matter how curious you are, never approach a bear! Brown bear © Shiretoko Nature Office Co., Ltd.
Protection and control activities for bears and other wildlife are carried out by the Shiretoko Nature Foundation. In order for the people and bears in Shiretoko to coexist, activities are carried out to keep the bears away from people. When a bear comes near people, it is not killed but chased away with rubber bullets that cause temporary pain or with firework bullets that create bright light and a loud sound. Bears that become too used to humans may attack them, so the Shiretoko Nature Foundation staff make sure to use methods like this to chase them away. In order for humans to coexist with the bears that live here, you must follow the rangers’ instructions and not do anything that may impede their work. An indigenous race called the Ainu people also live in Hokkaido. The Ainu people used to be hunters and gatherers, and the wildlife that provided them with food sources for life were worshiped as gods (kamuy). Bears, for example, are called kimun kamuy, which is Ainu for “gods of the mountains”. The Ainu people believed that bears were mountain gods who descended from the mountains bringing them furs and meat. Unlike the gods celebrated at festivals, bears were considered a vital food source for the Ainu people, and they hunted them with belief that their fur was a gift to protect them from the cold. 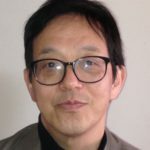 In addition to hunting bears and using the spoils effectively, the Ainu people also held a ritual called Iyomante, where they sent the soul of the bear back to the garden of the gods, believing that if they did not do so, the mountain gods would no longer bring them meat and furs. Other gods in Ainu culture are orcas, known as repun kamuy (gods of the sea) and salmon, known as cep kamuy. Incidentally, Yezo deer are called yuk kamuy. Yuk means “food”, showing that the Ainu people depended greatly on Yezo deer for food. While bears were called mountain gods, occasionally one would be called a wen kamuy. Wen means “bad”, so this apparently indicated that the bear was dangerous to people. We must all take care to follow “bear etiquette” when enjoying the nature in Shiretoko, so that we don’t invite wen kamuy ourselves. 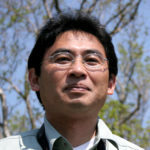 After spending two years working at Lake Utonai Sanctuary as an employee of the Wild Bird Society of Japan, I worked at the Shiretoko Nature Center for 15 years. After retiring, I established the Shiretoko Nature Office. I’ve been interested in nature ever since I was a child, and when I visited Shiretoko Museum in Shari, I felt like my life had begun. In addition to my work as a nature guide, I also train many new workers. I was born and raised here, and if I may say so, nobody knows more about Shiretoko than me. 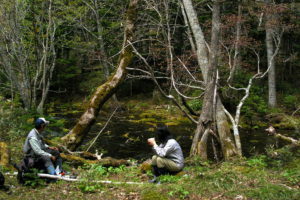 Shiretoko Nature Office carries out a variety of work such as sharing nature protection principles with as many people as possible, promoting eco-tourism, sharing Shiretoko’s heritage site with as many visitors as possible and preserving the nature of Shiretoko for future generations. Nobody is better at sharing what’s great about Shiretoko than professional nature guides who live here and see Shiretoko’s year-round. About 1 hour from JR Abashiri Station to JR Shari Station by the JR "Senmo Line" or a bus on the "Koshimizu/ Shari route". From Shari Station, take a bus on the "Shari route" to the "Utoro Onsen Bus Terminal" bus stop, then walk for 20 minutes. Gojiraiwa Sightseeing offers different tours on the east and west sides of Shiretoko peninsula. 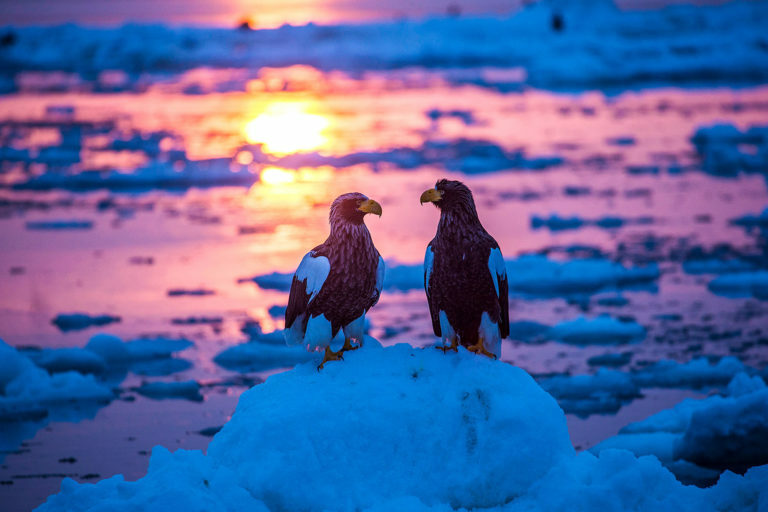 With all kinds of wildlife watching in summer and drift ice cruises in winter, there's something for every season. About 1 hour from JR Abashiri Station to JR Shari Station by the JR "Senmo Line" or a bus on the "Koshimizu/ Shari route". From Shari Station, take a bus on the "Shari route" to the "Utoro Michi-no-eki" bus stop, then walk for 10 minutes. In summer and during the ice floe season, direct buses also run to Utoro from Memanbetsu Airport and from in front of Abashiri Station. About 3 hours 30 minutes from JR Kushiro Station by an Akan bus bound for "Rausu Eigyosho". Get off at the "Rausu Honcho" bus stop. Enjoy thrilling tours that are only possible on a small boat. 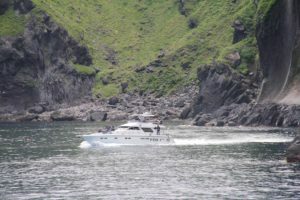 As the boat travels past waterfalls, fascinating rock formations and incredible cliff views, your guide will point out bears and rare birds such as white-tailed eagles and spectacled guillemot at every turn.